Alejandro Argumendo and Katherine Mazjoub for reviewing prior to publication, and Nico Correia for update. The Vilcanota range, which includes 469 glaciers, is the source for a vast watershed system that feeds both the valleys of the high Andes as well as the Amazonian rainforest below to the east. These waters have sustained an immense diversity of organisms as well as many great cultures from the Wari and Inca to today’s Quechua highlanders and many Amazonian peoples. As the Earth warms, the glaciers are melting rapidly, causing changes in ecosystems and altering the way people have lived for millennia. As Machu Picchu and the Sacred Valley to the north become more popular, international travelers are drawn to the Vilcanota region. The growth in tourism poses a very real threat to many species of trees, birds and megafauna such as pumas and vicuña. Mount Ausangate has been sacred to many of Peru’s cultures throughout history. Incan legend tells of two comets shooting forth from Ausangate to warn of the coming death of the father of Pachacuti, the founder of the Incan empire. Incans thereafter made offerings of precious metals to the mountain apu. Today, the indigenous Q’eros community of Quechua people revere the mountains of the Cordillera Vilcanota, believing that they are divinities to be protected. The apu‘s servant cat Ccoa holds court in the belly of Ausangate in a palace that only great shamans dare to visit. The glaciers on Ausangate are where the spirits of the dead wait for salvation. Around 50,000 people make an annual pilgrimage to Ausangate each June during the festival of Q’olloy Rit’I, “The Star of the Snow.” Although no one knows when the ceremony began, it likely has ancient origins in the people’s early astronomical reverence. With the introduction of Catholicism, the people began to carry a cross during this ceremony, placing it in the snow to honor both Jesus and the apu. Qoyllur Rit’i pilgrims see that their revered Colquepunku glacier is rapidly receding – more than 600 feet in 20 years. As a result, the ritual of carving out glacial ice and bringing it down to the community as a blessing was banned by festival authorities in 2003. Led by shamans, the Q’eros have practiced rituals for centuries that are equivalent to what we today call “adaptive resource management,” involving the growing and consuming of certain plants, and restriction of grazing animals on alternating pastures. These practices have protected the ecosystem to this day. The Q’eros also rely on and have protected the glacial waters from human and animal contamination. However, despite these cultural traditions, the region is threatened by resource exploitation, changing global climate and the influx of hundreds of thousands of tourists each year. The Vilcanota region is a growing area for tourism, mining, logging, and the grazing of livestock, all of which threaten to destroy much of the biodiversity as well as the native culture. Weather patterns also have been changing, leading to sporadic rainfall and melting glaciers. Tourism to the famous Incan site of Machu Picchu in particular-averaging around a half million people a year-has brought problems, as well as approximately $100 million, to the Peruvian Andes. However, as one community president, Ciriaco Grispin, has emphatically noted, the dollars have rarely ended up in the pockets of local people. Many locals believe that current water shortages are the result of the apu being angry with unbelieving and disrespectful tourists. Tourism is only one of several ways that the region is being exploited. The growth of cattle grazing in the fragile Andean highlands and mass mining practices have caused a shift in land management from small, local farmers and companies to non-indigenous or foreign-owned corporations that have failed to protect the environment and the rights of laborers and citizens. Local communities are facing pressures to change their livelihoods and their lifestyles to accommodate these external forces. What is potentially most damaging to the spiritual and natural environment around Vilcanota is the devastation to the glaciers from global warming and the growth in the nearby urban population-especially in Cuzco and Lima-which has depleted water resources for farmers and rural families. The combination of the change in annual precipitation and the carbon dioxide released by industrialized areas means that Peru faces a diminishing water supply. The Association for Sustainable Development’s Millennium Assessment team, locally led by Alejandro Argumendo, has been studying changes in the local environment and working with the small indigenous communities to evaluate how to prevent further changes. Their work led to the proposal for the Vilcanota Spiritual Park, which would directly benefit the communities and their culture as a recognized “Community Conservation Area” and through entrance fees and direct investment. Based on the success of the Potato Park (an Indigenous Biocultural Heritage Area), the Vilcanota Spiritual Park would emphasize indigenous and traditional management of conservation and agrobiodiversity activities with a goal of poverty alleviation based on local concepts of well-being. The park will protect the area’s fragile biodiversity through the designation of natural sacred sites. “Because of restricted access to some areas with voluntary protection measures exercised by the local population, natural sacred sites conserve local ecosystems and their unique biodiversity in an effective and efficient way, so they can serve as repositories of critical biological resources for the rehabilitation of depleted Andean landscapes,” Argumedo-who is also Director of Asociación Kechua Aymara para Comunidades Sustentables (ANDES), a community-based Qechua-Aymara organization-said. Traditional management of Vilcanota Spiritual Park is intended to be a model for future special conservation areas in the Peruvian Andes, and around the world. The government of Peru, Asociacion ANDES and the community-led Pro-Vilcanota Spiritual Park Committee will implement and maintain the park. They hope to link it with other Indigenous Biocultural Heritage Areas like Potato Park, Lares Barter Markets Park and Andean Camels Park. For now, Vilcanota is a “paper park” where enforcement of its rules and boundaries is weak and infrastructure and staffing are non-existent. This makes local leaders uneasy. “We need people to recognize the park that we are establishing, but equally importantly, we need people to recognize and respect our culture. The work we’re doing with native potatoes, medicinal plants, and everything else we harvest are all very important to our communities. I think it’s important that our communities stay strong and work together to make sure this park becomes a reality,” said Santos Mayhua, a local mayor. For now, Vilcanota Spiritual Park is an evolving project. The International Center of Traditional Knowledge, Ecology and Policies (CICTEP), part of the Asociación ANDES, led the Millennium Ecosystem Assessment. 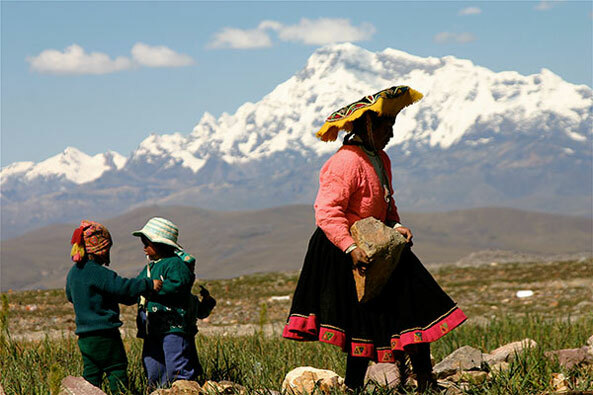 To undertake the assessment, CICTEP worked with the Ausangate Community Millennium Assessment Association, which includes the indigenous communities of Tinqui, Tayancany, Cotaña, Mahuayani, Pausipanpa and Anjasi. International organizations including the Convention on Biological Diversity, the World Conservation Union and the International Institute for Environment and Development lent technical support. “This community-led initiative is an inspiring example of how international policy instruments, like the [Convention on Biodiversity], can be used to affirm the rights of indigenous peoples’ to self determination and territorial control. Vilcanota Park is a breakthrough for policy and practice,” Michel Pimbert of the Institute for Environment and Development, said. Asociación ANDES. ANDES Asociación para la Naturaleza y el Desarollo Sostenible. Heckman, Andrea and Tad Fettig. Ausangate. DVD. Documentary Educational Resources, 2006. Millennium Ecosystem Assessment. “Peru: Vilcanota Sub-region.” Millennium Ecosystem Assessment. TV/E. “The Eco-economy, Part 1.” Earth Report. United Nations Environment Programme. “Conserving Biological Diversity Becomes a Sacred Quest.” News release, March 18, 2006. World Bank. “Vilcanota Valley Rehabilitation and Management Project.” The World Bank.